The Peranakans of the past were known to observe etiquette and decorum notoriously. It began at home where everyone was expected to know how to address one’s relatives correctly, making sure one could differentiate the nuances in one’s relationships with their “pek“, “engku“, “engteoh“, and “chek“, terms which are often reduced to a simple “uncle” nowadays. Out of the family context, it was important to know and observe the social hierarchy put in place then and not only understand, but also be well adapted and assimilated into one’s designated role. In short, one is expected to know what the “pecking order” was like and how to will one’s means to reap and benefit the most out of it. It was important for a baba or nyonya to be seen as being “proper” or in Peranakan terms, “tau adat” which basically translates to “know your customs and practices well”. Only then can one be described as being “alus” (refined) or for the nyonyas “senonoh” (elegant and demure) rather than being “kasair” (uncouth). Social behavior was maintained to the strictest order and it was of pertinence for one to be “well placed” into his or her position in society, with the Peranakan families well connected amongst one another through intermarriages, maintaining a close relationship with the colonial masters whom they collaborated or worked for, as well as the sin kheks whom these baba towkays employed and provided for. 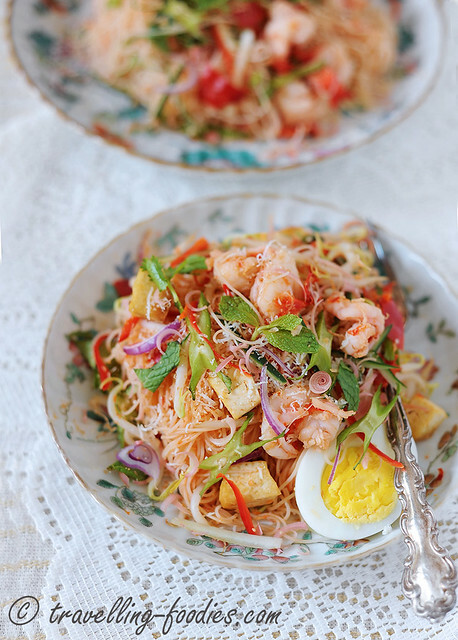 Protocol and formalities once perpetuated every aspect of the ways of life of a Peranakan, even in its cuisine. Some dishes were cooked specifically for certain occasions and having them appear on the dining table otherwise was a big no no. For example, “pongteh” was a dish prepared for semayang abu (ancestral prayers) and not to be confused with “chin“, a very similar dish which was associated with weddings instead. The same was with the “kueh culture” for the Peranakans, colour coded to highest levels of specifications, red and yellow for festivities while green and blue were for funerals. But over the years as the generations evolved, many converted to Catholicism or “masok Christian” and abandoned these practices, while for others the “reins” faded and eventually disappeared as they became more influenced by Western culture, married out of the baba-nyonya community or simply migrated to a part of the world where Asian culture isn’t a mainstream, let alone the Peranakan way of life. As such many aspects of the “adat” and its “rules” became relaxed, with only a handful of puristic Peranakans still stauchly following the very traditional customs to the strictest order and in full regalia. 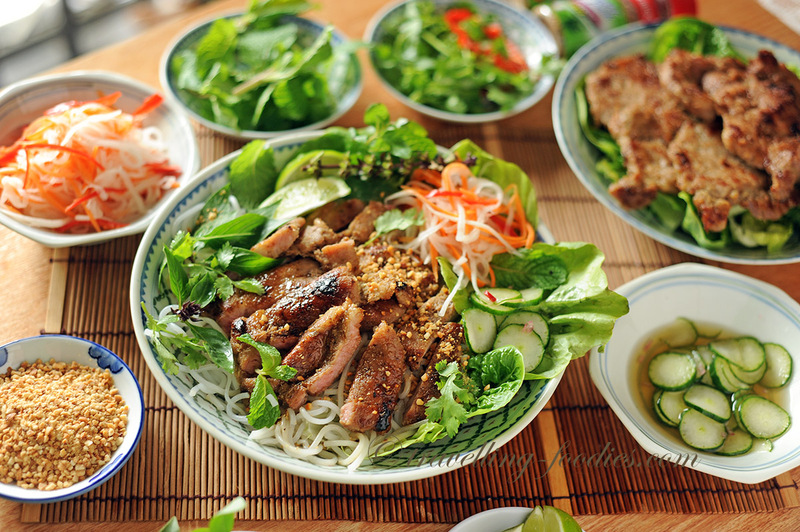 Thus, it is not uncommon, to find dishes which were previously cooked for separate occasions appearing on the same dining table nowadays. 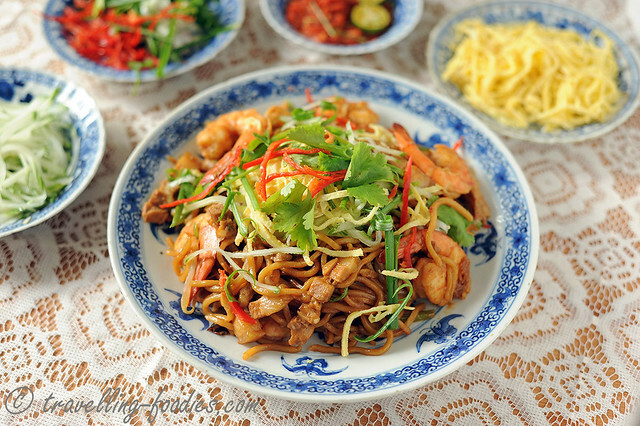 The identity of certain dishes also evolved over time, and one of them is Nyonya Mah Mee, which is sometimes just called Mee Nyonya. Talk about street food in Taiwan and one cannot dispense discussing “Oh-Ah Mee Sua” 蚵仔麵線 Taiwanese Oyster Mee Sua. 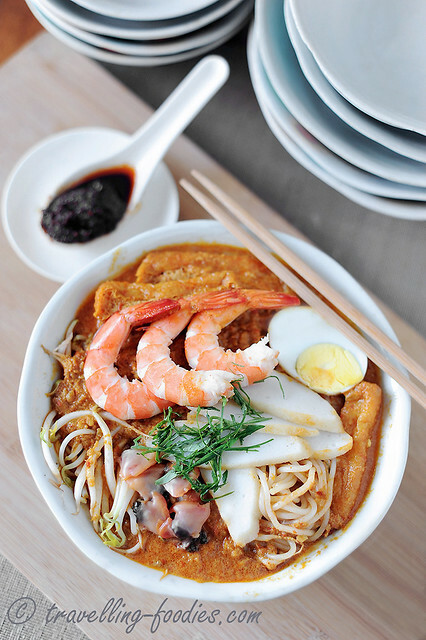 With humble beginnings as a “poor man’s snack”, Oh Ah Mee Sua soon became an internationally renowned dish which one would flock to eat when they visit Taiwan. That is certainly the case for me. Over time, two versions evolved, one which uses fresh oysters 蚵仔, and another with braised large pig intestines 滷大腸, both equally popular with their own loyal followers. I love ’em both as they offer very different experience in flavours and textures. 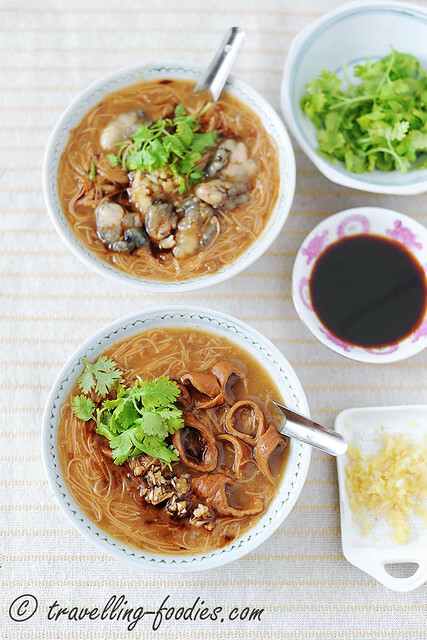 So if you like Oyster and Large Intestines Mee Sua like me, do give the recipe a try! The last installment of Malaysia Food Fest (MFF) brings us to Perak and it is just in time for Eid al-Fitr. After a long month of Ramadan, it is time for our Muslim friends to break fast and celebrate during what is more commonly known as “Hari Raya Puasa” over here in Malaysia and Singapore. One of the absolute must-haves for Hari Raya celebration is a spicy beef stew which originated from Indonesia called “Rendang“. I’d cooked Rendang Daging Rembau earlier this year for Negeri Sembilan but rendang cooking has a long withstanding tradition in Malaysia and has since evolved and developed so many varieties, with almost every state having their own unique variation. So it comes as no surprise that Perak too has its own “special” rendang and rightfully so as it is very famous, enjoyed by not only the Perakians but also visitors to the state. 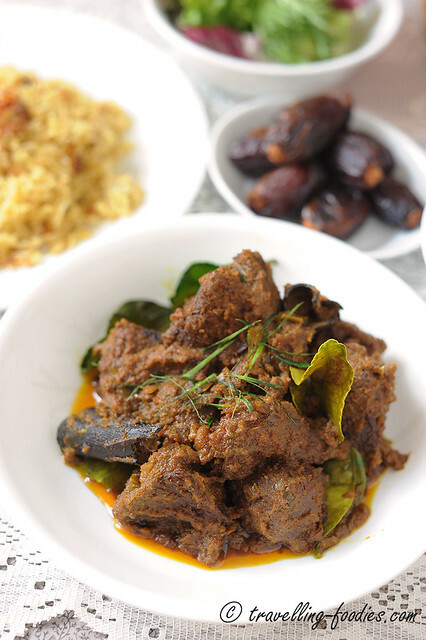 “Rendang Tok” as it is known, with “Tok” to mean royalty, this delicious rendang is literally food befitting the kings! 适耕庄 Sekinchan is a small fishing town in Selangor, bordering Sebak Banam and Kuala Selangor. The Teochews were almongst the first group of Chinese to have settled here and took up fishing as their main trade and still continue to do so. Apart from selling their produce to neighbouring cities like Ipoh and Kuala Lumpur, one of the highlights in Sekinchan is their seafood processing industries, which transform the daily local catch into fish paste and shrimp paste which are then used to make fishballs, yong tau foo, fish noodles as well as prawn crackers. 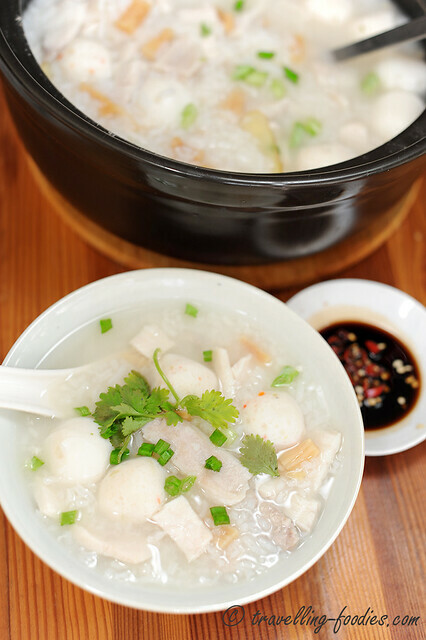 Needless to say, these fresh seafood also contribute to some interesting dishes which are unique to Sekinchan, one of which is the Sekinchan Teochew-Styled Shark Porridge.